One discussion that often heats up a prepper conversation is what you should be on your Bug Out Bag Checklist (Top 10 Bug Out Bag Items). Most often it’s one opinion, versus another, then another, and so on until the conversation melts down. So, today’s episode is going to address the Bug Out Bag Checklist (Top 10 Bug Out Bag Items) everyone should consider putting in the bug out bags. Now, these items aren’t my opinion, these items are the result of polling a number of awesome people within the Mind4Survival Facebook group, and if you haven’t joined the group yet, make sure to hop on Facebook and click the join button. 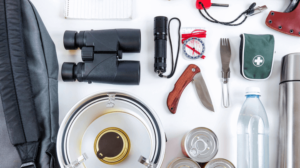 When it comes to bug out bags, and many things within our preparedness community, opinions are like flashlights, everyone has one or in many of our cases, a dozen or more. Am I right!? Give me a big Hoo-Yeah, if you’re a flashlight hoarder like me! Because so many people have different opinions about what should be in a bug out bag, that I decided to ask the Mind4Survival Facebook group what they thought. Then, I took the answers and compared the commonalities between the lists, ranking the most included items. When it was all said and done, we ended up with a list of ten basic items that should be the foundation of all bug out bags, plus a few other items that just missed making the top ten list. So, in this episode, we’re going to cover the Top 10 Bug Out Bag Items that everyone should include on their Bug Out Bag Checklist and why those items are important. Plus, I’m going to cover some of the runner-ups that are definitely in the runner-up positions. And finally, we’re going to go over the difference between the foundational “must have items” in your bug out bag, and the optional nice to have’s that we all need to consider when preparing for our individual situations. The ten items that are listed here, are in my opinion, the items that every bug out bag should have. With proper practice and training, everyone can do really well in difficult situations with just these items. Heck think of the show Alone and what the contestants achieve with just a few simple items. Remember though, I mentioned practice and training. As Vince Lombardi said, “Practice doesn’t make perfect. Perfect practice makes perfect.” So, practice, train, think and prepare yourself to not only use the gear you have but to use the gear you have to not only survive when the odds are stacked against you. Once you pack your “Must Have” items, you should then pack the items that are “Must Haves” specific to your situation. Perhaps you have a medical condition that requires you to pack medications. Maybe you have children to think about so, you need to pack certain things for them. Basically, whatever you absolutely need to survive, goes in the bag next. Don’t forget to take your environment into account and preparing for problems that are specific to you and your situation. With all of the foundation “Must Have” and Personal “Must Have” items packed, you can then pack gear that is “Nice to Have.” For example, now is when you pack the items that didn’t make the list such as a memory stick with important documents on it, a battery bank, solar charger, emergency radio, or even some candy. This is the point where you personalize your bag to fit your needs and wants. Now, remember, when packing the “Nice to Have’s,” to not go overboard. Packing a library of books in your Bug Out Bag may sound good at the time, but won’t seem so great when your feet and back are screaming at you. It’s at this point, when packing the “Nice to Haves” that many people go crazy and their bug out bag skyrockets from a manageable weight, to something that a semi-truck is needed to haul around. The “Nice to Have” items are also the items that you’ll put to the inclusion test when you’re out training with your bug out bag. The inclusion test is the mental yay, or nay that you give during or after training when you realize that something isn’t needed, so you can ditch it. If you find an item useful, you’ll keep it. If it doesn’t work like you thought, or you never use it, then you should consider dumping it to save on weight, or to make room for other more useful gear. If you have any other thoughts or questions about the Bug Out Bag Checklist (Top 10 Bug Out Bag Items), please leave a comment below.